Mental health – is living in the park really an improvement? 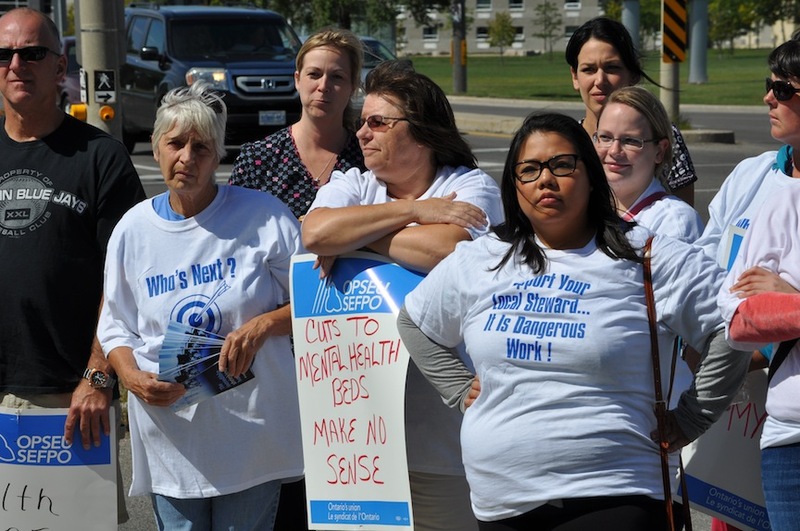 Protesting outside of Kingston’s Providence Care September 9. KINGSTON – Tracey Newton has worked at the old Kingston Psychiatric Hospital for 25 years. In that time she has seen many changes, including the tightening of access to the hospital’s services for those in the community that need help. She arrived early at McBurney Park on September 2nd for the local march and picnic celebrating Labour Day. As the labour activists arrived, the homeless departed the park, including some of her former patients who had clearly spent the night there. In our heightened skeptical age it is too convenient to dismiss workers as being self-interested, but it was clear speaking with Newton yesterday that the encounter was upsetting. With another 40 beds due to close, how many more former patients are now going to be sleeping rough? The mantra in mental health has been community care, not institutional care. It has given the government the cover to make massive cuts to beds and outpatient services delivered by the province’s psychiatric hospitals. It hasn’t meant replacing the scale and scope of these services in the community. Kingston’s Providence Care is getting squeezed by more than bed reductions associated with the outdated planning associated with new semi-privatized replacement hospital. They are seeing more developmentally disabled patients admitted to these beds, likely part of the consequence of closing the former Rideau Regional Centre in Smith’s Falls. Those patients too were supposed to be better off the in the community, but here they are. That means more demand at a time when the province continues to cut back on this hospital. Workers will lose their jobs. The hospital estimates that the next wave of job cuts will represent about 60 full-time equivalents, which should translate to 80-90 actual positions. That’s 80-90 fewer people who will be there to help – or nearly one in five staff that presently work there. Yesterday nearly half the hospital staff came out during their lunch period to join up with community members who were upset by the ever shrinking hospital. Ross Sutherland, community co-chair of the Ontario Health Coalition, told the group that the new private consortium that is expected to be awarded the contract to build, finance and maintain the replacement hospital for 30 years, will be receiving a return on investment of about 12 per cent. That’s also what Kingston’s City Council was told earlier this spring by Infrastructure Ontario. That’s a lot of money that won’t be going to accommodate the mentally ill or the developmentally disabled. Mary Rita Holland, the Kingston NDP nominee for the next provincial election, said she was concerned about the loss of jobs here. Public Services not only assist people when they need it, but they are also a major contributor to growth in the local economy. These additional 80-90 jobs lost in the community will not help the shop owners on Princess Street. No final cost has been arrived at for rebuilding Providence’s mental health and rehab hospitals, but it expected to come it at about $350 million. Last year’s Sunshine List indicates that in 2012 Providence CEO Dale Kenney earned more than $350,000 in salary and taxable benefits. Unlike Newton, Kenney is a relative newcomer having landed his job in 2008. At that income level it is unlikely Kenney is spending much time in parts of the city where his former patients are now living. Unlike Newton, if he were to see them leaving the park in the early morning, would he even recognize them as former patients? Would he understand what they are doing there? Watch this space later this week for our video of the day’s events, including comments by OPSEU leaders President Warren (Smokey) Thomas, VP Chris Cormier, and regional board member Dave Lundy (below). 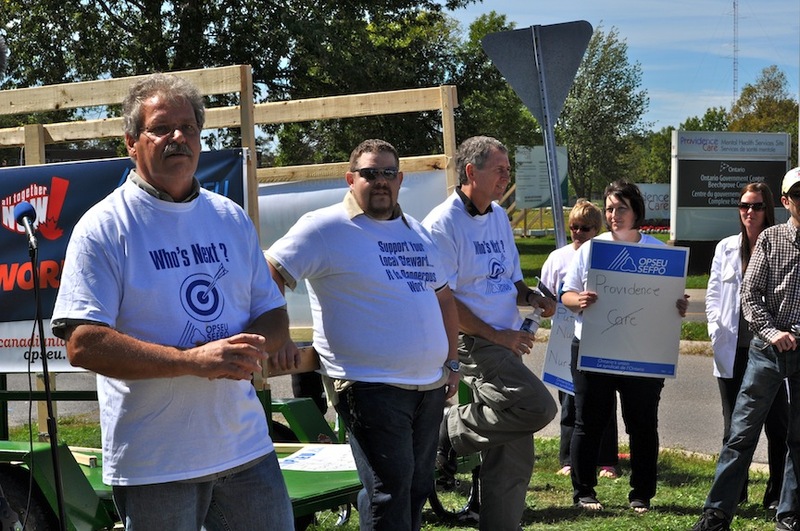 OPSEU leadership at the September 9 protest (L to R): President Warren (Smokey) Thomas, VP Chris Cormier and board member Dave Lundy. This entry was posted in Uncategorized and tagged Developmental Disabilities, Homelessness and mental illness, Kingston Providence Care, Mary Rita Holland, McBurney Park, OPSEU demonstration September 9, OPSEU Local 431, Providence Care, Rideau Regional Centre, Tracey Newton. Bookmark the permalink.